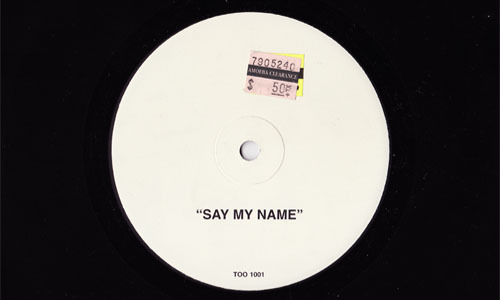 a crappy remix of Destiny's Child's "Say My Name"
On a recent trip to Amoeba Records, in addition to the records I wanted, I picked up a few $.50 singles sitting on the ground in the clearance bins to see what I’d get. The first of those singles is this horrible remix of Destinys Child’s “Say My Name”. As you can see, this record’s label only had the song’s title printed, and the sleeve it came in was plain and white. I also picked up this single of a Basement Jaxx remix of Kelis’ “Trick Me.”As you can see, whoever owned this record before me wanted to make sure that no one ever played this single as a 33 (which I did) and kindly wrote “45” on the label.